They were developed by Eisenwerk Weserhütte of Bad Oeynhausen. Chassis were built by Auto Union in Zwickau and assembled by F. Schichau of Elbing andMaschinenfabrik Niedersachsen in Hanover-Linden. The Sdkfz 222 was examined by Soviet designers before they created the similar BA-64 light armoured car. 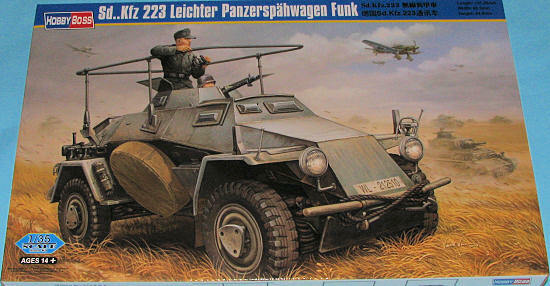 The SdKfz 223 is a radio car version, armed like the 221 with a 7.92 mm MG34 machine gun. Included additional radio equipment, and had a large "bed-frame" antenna over the vehicle. Over 500 of the SdKfz 223 were produced. 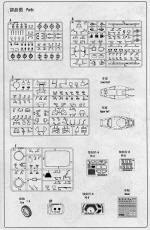 Molded in Hobby Boss' typical light grey plastic, the kit is packaged with one sprue per poly bag. The exceptions to this are the upper and lower hull which are in one bag and the four rubber tires which are in another. 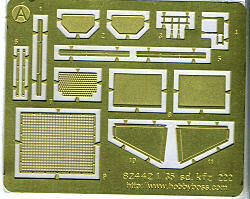 The kit's three photo etch sprues are packaged with a section of thick card to keep them unbent.The box is even divided with a separate section to keep the hull halves in good shape. The detailing on the parts is first rate. There is no flash, I found no sink marks and while many parts have ejector pin marks on them, assembly will determine how many, if any will be visible in the finished product. The kit includes a full chassis complete with frame rails, cross members, differentials and suspension parts. There is also a complete transaxle assembly and what appears to be a full motor as well. Unlike many other 223 kits, this one comes with a full interior as well, complete with weapons stowage. The photo etch is an integral part of the building of this kit so one cannot really leave any of it off. Of course, much of the p.e. is used for the anti-grenade screens, but there are a myriad of other places where it is used, both inside and outside the vehicle. Unlike the earlier SdKfz 222, this one has a 7.92 mm MG34 machine gun as its main armament. Even the rubber tire s are superbly done and add a bit more realism to the finished kit. 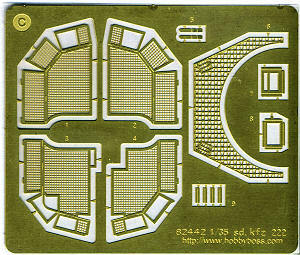 As this is the radio command version, there is a sprue insert that includes the quite prominent radio antenna. Instructions are on two large fold-out pages that include painting information during the build in generic and Gunze colors. The overall painting guide is full color and offers more paint choices. 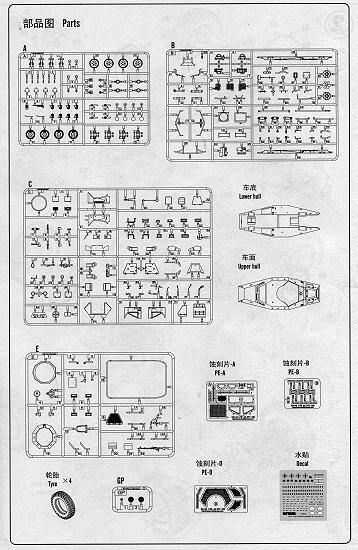 The painting guide shows just a Panzer Grey vehicle and no unit info9rmation. However, the decal sheet has a variety of license plates that you can use the individual lettering to make your vehicle unique. 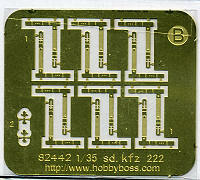 The decal sheet is well printed and should prove to be easy to apply. I've always had good results with Hobby Boss decals. All in all it is a superlative kit that should make into an equally impressive mode. While the price may seem high, considering all the detail that you are getting, it is reasonable. About my only wish would have been for crew figures, but you can easily get these from stand-alone figure sets. My thanks to Squadron Products for the review kit. Get yours at your local shop or on-line retailer.